Earth pressure cells (EPCs) are widely being used for the measurement of pressure acting on structures or within the soil. Output from an EPC varies with properties of contacting media (fluid or soil), density of media, etc. As geofoam is used in many geotechnical applications, especially to control earth pressures, it is prudent to calibrate earth pressure sensors, with geofoam as a contacting material with EPCs (geofoam calibration of EPC). In the present study, two diaphragm-based EPCs of different make are used to perform in-soil and geofoam calibration studies. A deadweight calibration set-up is developed to perform both soil and geofoam calibration tests. Effect of soil thickness, geofoam thickness, combined geofoam and sand thickness, geofoam density and displacement/loading rate on the EPC output under external loading is studied. From soil calibration results, it is observed that optimum sand thickness is 4.17d for both types of EPC. The response of EPC in geofoam calibration resembles the stress–strain response of geofoam, and it varies with the density of geofoam. At any applied pressure, output from an EPC is much higher in the case of geofoam calibration compared to that of soil calibration. 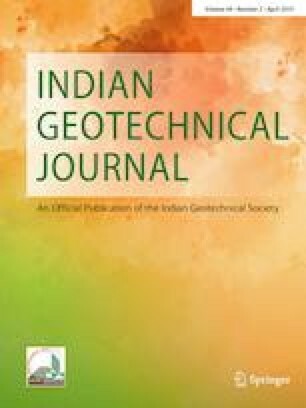 The authors gratefully acknowledge the financial support received from the Ministry of Earth Sciences, Government of India (MoES/P.O(Seismo)/1(118)/2010), to carry out the research.